This Easy to Assemble Model Rocket Kit is powered by standard 18mm Estes or Klima engines. 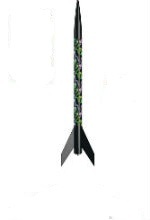 Even undead, this model rocket kit can reach heights of 1100 feet or more with a Klima D9! Skill Level E2X means Easy to Assemble so you will be at the launch site in no time at all. All rocket parts are pre-colored and glue quickly together with some tube type plastic cement or CA glue.